Half a Century of Pie, Wowzers! 50 Pies. Half a century of this meat filled madness and I’m loving every minute of it. I hope you are too, and what better way to celebrate my fiftieth meaty masterpiece than by writing a review about it in all its delectability. It’s the third pie of the week and a return to junior football, where this journey started. 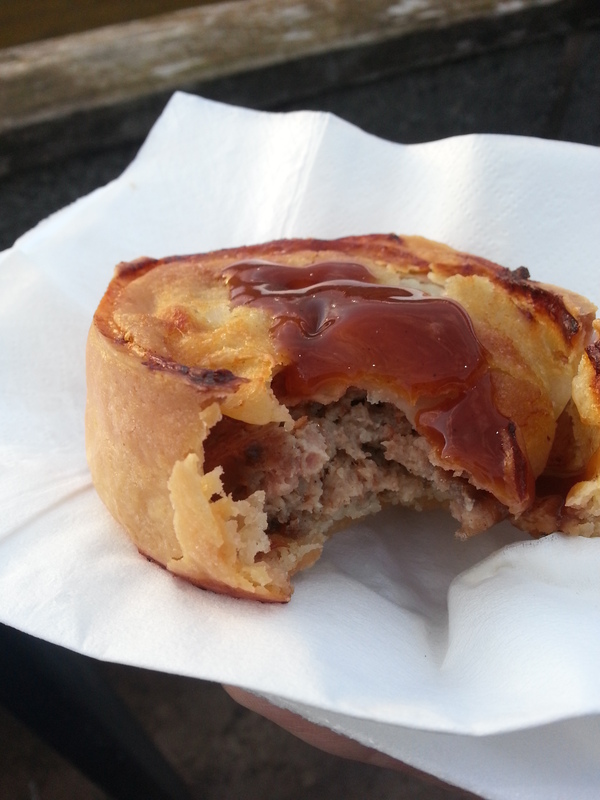 Lower league football is where the true diversity in pies comes from, unlike stadia such as Ibrox, Hampden and Celtic Park the pie proprietors at these ground tend to use local butchers and suppliers creating their own unique taste sensations. My promise to you is as we continue to set our sights on 100 handfuls of pastry perfection is to find even more pies from as many nooks and crannies of Scottish football as I can. So without much further ado, let’s add another chapter to this Pynasty, and rate some pie! 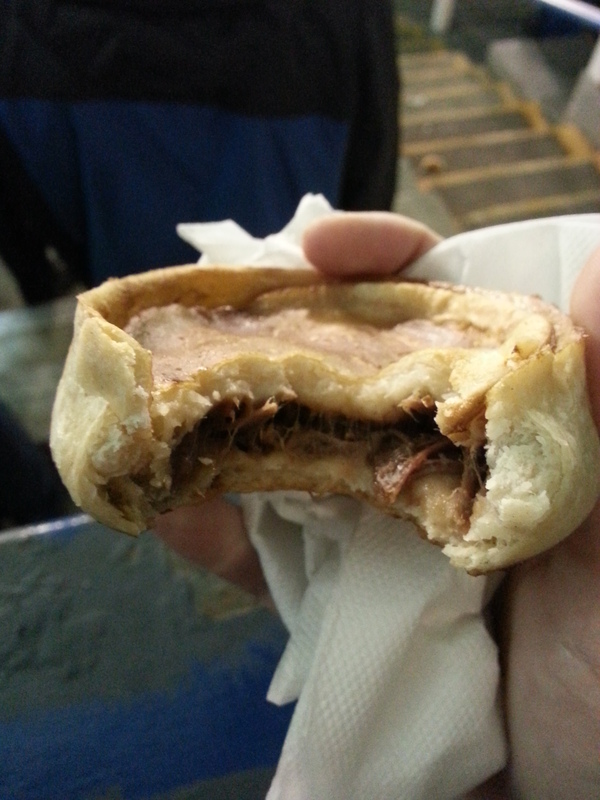 Price: £1.20, proving that from west coast to east in junior football £1.20 is the price for your pie to be. Presentation: It’s baaaaaack! Almost knowing that this was the fiftieth pie, the little black dress of the pie world, the medium-sized white napkin struts its gravy catching stuff once again. A timeless look for these meat and pastry beauties. I think I can honestly say that this pie took me on the kind of journey that would see The Hairy Bikers try to stretch a 10 part TV series out of it. My only grumble was that it could have been warmer but given the particularly chilly conditions of the day I’m willing to let that slide on this occasion. Pastry: As I write this review I’m struggling to remember exactly what this pastry tasted of suggesting that it was nothing spectacular. What I do remember though is its appearance with the lid sealed all the way to the top as opposed to leaving a small lip that most scotch pies have. It was also flakier than usual, so much so that when I finally got home a couple of hours later and untied my scarf there were still crumbs of pastry scattered across my top. Functional pastry with a twist on the traditional pastry casing. Overall: A pie that seemed to get better the more I remembered about it. It’s ever-changing flavour profile being a particular highlight with its shortcrust/puff pastry hybrid casing adding a dimension that makes it stand on its own. Gravy Factor: Nostalgic Gravy. The kind of gravy that the longer you leave since you had it the better it seems to taste. Well I did it. When the week started I thought I would struggle to get three reviews done before my next footballing adventure. 50 is a great achievement and I have surprised myself with the dedication I have shown to the pie cause, here’s to 50 more. The next stop might be meaty but is it going to be all about the pie? My latest piece ‘The Descendants of Djemba Djemba’ can be found not only on Leading The Line but also at http://terracepodcast.net/ looking at some of the African players who have left an impression on Scottish football, both good and bad, once again it’s not about pies but I promise you it’s thoroughly decent. 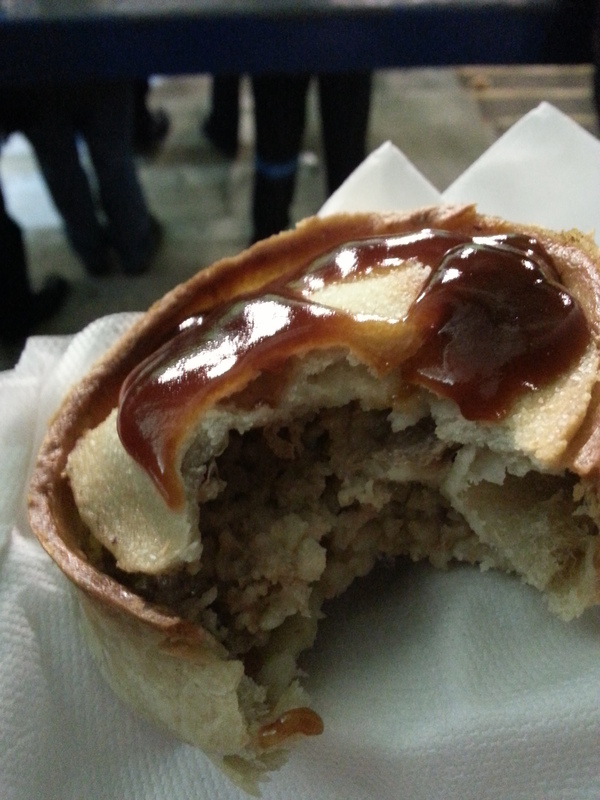 This entry was posted in Football Pies, Junior Pies, Sporting Pies, The Life of Pie and tagged Football, Gravy, hairy bikers, junior football, leading the line, Meat, meatfilledmerch, meatfilledpastries, mince, pastry, penicuik, pollok, scottish football, terrace podcast. Guess what? It’s time for another entry into the Meat Filled Pastries Hall of Fame. Yay! Before we get started I want to share one of the many reasons why I enjoy venturing to football down the leagues on a weekly basis. My first game of football was part of generational tradition, my dad was taken by his dad, he then took me and, if I ever screw the nut and stop gibbering on about pies, I would like to keep that tradition going. We always stand in the same place, with the same people around us, different ages and backgrounds all gathered to take part in the joy of a Saturday afternoon at the football. A lot of the time, the discussions would continue long after the final whistle had gone in the pub round the corner leaving me with people who have been watching football for 50, 60 years and regaling stories of a time when the team were so much better than they are today. I love that. The unity that football brings amongst those who would more often than not be strangers. Unfortunately this past week, one of those friends passed away, but instead of being sad about the life that’s been lost I’m thankful that I took the opportunities I had to listen to the stories he told and for the continual enjoyment that this ragtag group of football fans bring me. I’d strongly advise that if you’ve sat or stood beside somebody for years and never said hello then get your thumb out your bum and fling out a wave, if all else fails you can always talk about the football. This week, as a small tribute, this review is for Bill. So without much further ado, let’s rate some pie. Price: £1.50, a price that I couldn’t see but one that the ladies behind the pie counter at Cliftonhill were happy to provide. About average for the level of football on offer in Scottish League Two. Presentation: A break from the classic white napkin…well kind off. It was a bit smaller than usual and it appeared to be pulled from a larger roll as opposed to an individual offering, but it was most definitely white. I think the next pie I have that does not come wrapped in a white napkin of sorts, I will nominate for entry into Le Louvre. 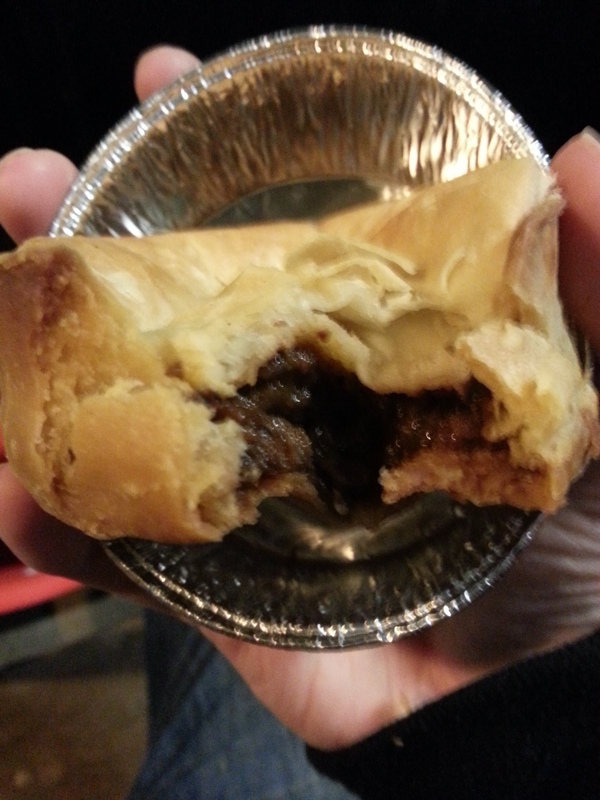 Meatiness: I would call this a proper mutton pie, well filled without being overly so. The meat was moist from it’s own juices and fell apart like a good pie should once bitten, almost perfect in texture. There was a lovely hit of pepper, not spicy but enough to notice it and the taste itself was totally changed once a bite was taken with the incredibly tangy brown sauce that was provided to squirt on top. If I hadn’t already had my lunch I most likely would have got another one. Pastry: The pastry was a standard crust, contributing to the overall pie eating experience without blowing me away. It held up well and there was no spillage as each bite was taken although the top was a little loose which meant the last two mouthfuls involved using both left and right hands. The pastry shouldn’t have to be the star of the show and in this case it wasn’t but deserves an honourable mention as part of the supporting cast in this mouthful of meat. Overall: A tasty pie, with the right mix of meat, pastry and spice. The brown sauce, as I said earlier, was extremely tangy and I imagine for some palates would be a bit too much but for me added another dimension of flavour that my taste buds enjoyed. Gravy Factor: Jolly good gravy with an optional brown sauce inspired tongue tingling kick. One more thing before we scrunch up the napkin of pie 47 and set our sights on more meat filled pastries. 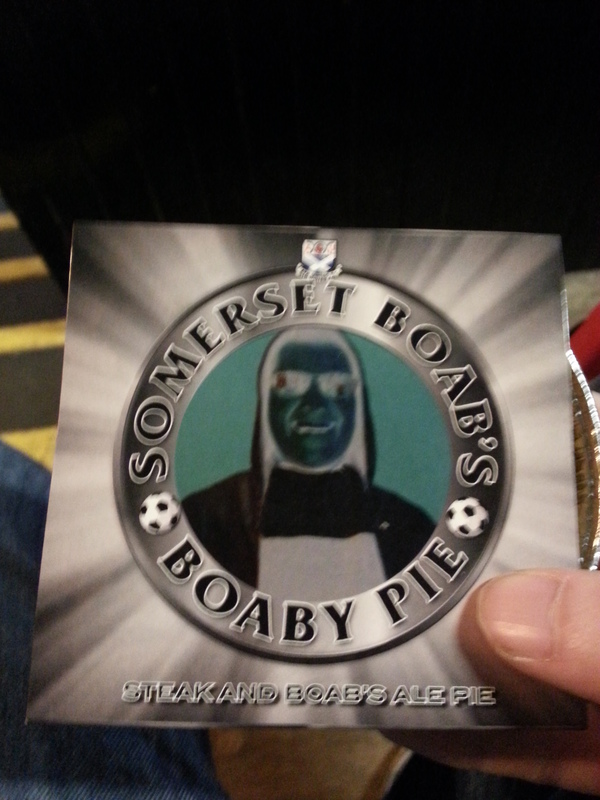 I have often said that pie makers at football grounds should do more to advertise their meaty wares. Well, I’m happy to report that at Cliftonhill there was advertising a plenty championing the name of JB Christies, who after a bit of research turn out to be quite the pie makers. If you make the pies, then make sure we know about it. 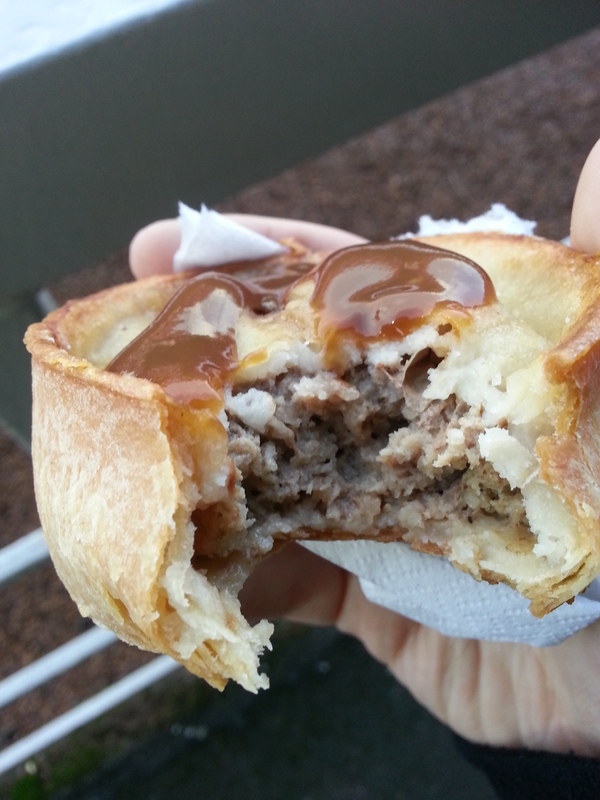 Next stop for Meat Filled Pastries, weather permitting, will be Penicuik Athletic from the East Region of the junior football scene but should that fail then the next stop on this tour of pie could be you! This entry was posted in Football Pies, Professional Pies, Sporting Pies, The Life of Pie and tagged albion rovers, arfc, berwick rangers, brown sauce, cliftonhill, Football, football blogging awards, Gravy, leading the line, league two, Meat, meat filled pastries, pastry, penicuik athletic, Pie, scottish football, spfl, vers. Hello to all my fellow pastry lovers, I hope you had a lovely festive period and that Santa brought you all the pie related gifts your heart desired. It’s been a couple of weeks since the last entry into the Pie of Hall of Fame but we have time to squeeze one more entry in before the bakers of 2013 close their oven doors one last time. A couple of developments to make you aware of since the last review. Firstly as some of you may or may not be aware I don’t write solely about pies, but try to squeeze out some other football related pieces when time allows me to. These articles have been run primarily through my sister site Leading the Line, and while articles will still appear there from time to time an agreement has been reached with ‘The Football Blogging Awards’ to become a regular contributor in 2014. It will allow me to keep Meat Filled Pastries as a solely independent venture whilst also spreading the word of pie through other channels, something that I wouldn’t be able to do without the support of all you delightful folk that read it. This brings me on to the second piece of news, for the remainder of the season my stories of pie can be found in the Albion Rovers match day programme. For Meat Filled Pastries to become a part of a fans match day experience is more than I could have wished for when I started this venture but now it’s happened I want more, and in 2014 I hope we will all see the growth of Meat Filled Pastries even further. So if you are interested in my tome of pie and would like me to contribute to your programme, magazine or website just drop me an email or send me a tweet. So without much further ado, and with the PR Campaign out the way, let’s rate some pie! Price: A rather expensive £2, a price that required asking as none was listed for a single pie. The same price as the ‘Premiership’ pie from Motherwell but more expensive than the Cowdenbeath offering and the various junior equivalents this journey has provided us with. Presentation: A break from the norm this pie was presented in a polystyrene tray. The reason for the polystyrene tray, you ask? Well this pie did not come from a loan standing pie hut at the side of the ground or from a kiosk in the bowels of the stand but from a chip shop van, a traditional one none the less, one of two conveniently located in the ground. Now this caused a small moment of panic in this pieman’s head, initially because I was unsure how traditional a Fish and Chip Van was at a football ground, but perhaps more pressing was the realisation that there may be no pies to review and as such this blog would have had more padding than Bobby Mann at the end of his playing career. That said I got a pie it was in a polystyrene tray, because usually they would have chips in them, and it came with a medium sized white napkin to mop up any meatfilled spillages. Disaster averted, let’s move on. Meatiness: This pie was a slow burner on the taste front. 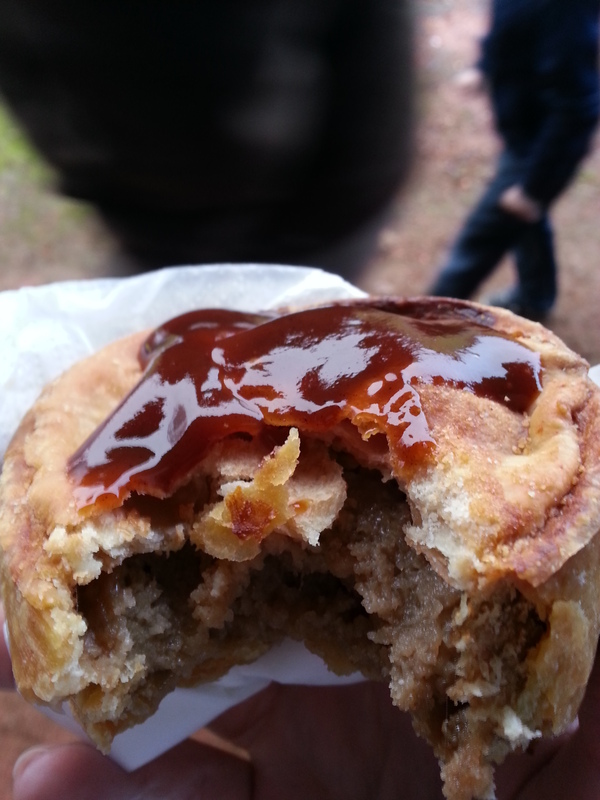 On the initial one bite expose the taste, although definitively of pie, was rather underwhelming and I had concerns that this would be confounded to the status of ‘Bog Standard Bisto’. However as each bite was taken the warmth of spice and pepper became more prevalent and by the last bite I found myself wanting more. The meat was well packed inside and not very greasy at all which is impressive considering my suspicions were this was a deep fried pie, but more on that in a moment. Despite the initial concerns of the first bite this was a tasty morsel indeed. Pastry: This is where my deep fried suspicions really started tingling. The pastry was incredibly golden and the pie lid itself had no hole in the top to let out steam that would be generated in an oven. Then there was the first bite, the pastry didn’t flake but more crumbled and where the pastry had tore away from the main body of the pie it had slightly disintegrated around the edges. It was of no detriment, although the further into the pie you got you became increasingly grateful for the polystyrene tray provided. Once again, just like the filling it was impressive how un-greasy the pastry tasted. If someone at Berwick can tell me if I’m right or wrong on the deep fried factor it’d be greatly appreciated. Overall: This pie was a pleasant surprise after the obstacles it put in front of itself before its consumption was complete. It was slightly expensive for the surroundings and the fact it came from a chip van was something that caused a bit of initial confusion. The ‘potential’ deep frying left the pie suitably moist and crispy without being over greasy and with a long slow burning flavour of mutton and spice. Gravy Factor: The marathon pie, remember pie eating is not a sprint, savour every bite and don’t discount it because your first bite wasn’t all your pie dreams were made of. Another pie down, another five minutes added to the tread next time I’m in the gym. 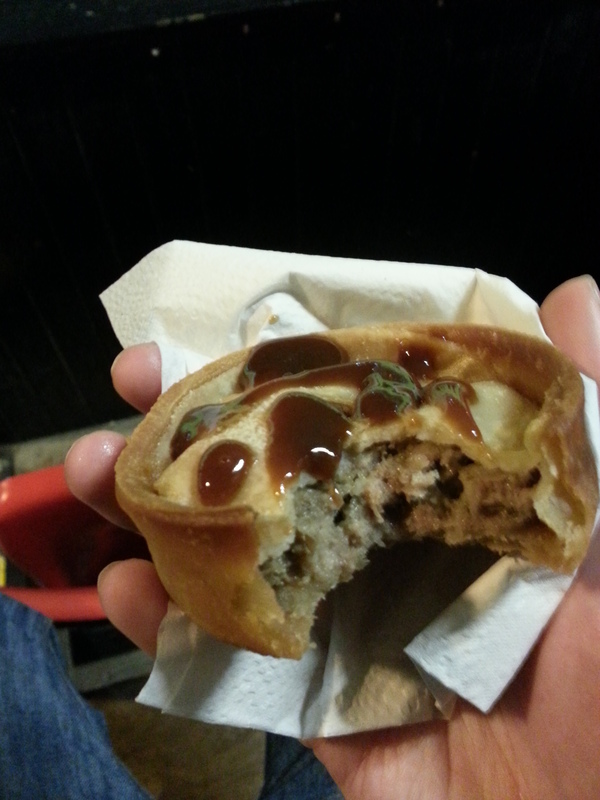 Work commitments mean that next weekends offering will most likely be either the first rugby pie of Meat Filled Pastries journey of pie or from the Scottish Premiership. Either way, until next time, go forth and eat pie! This entry was posted in Football Pies, Professional Pies, Sporting Pies, The Life of Pie and tagged albion rovers, berwick, bobby mann, brown sauce, chip shop, deep fry, Football, football blogging awards, Gravy, hp, leading the line, league two, Meat, peterhead, Pie, rangers, scottish football, spfl.